Many families with kids don’t have room for a full-sized air hockey table – and that’s a shame. Pool, ping pong, foosball and all of the other traditional activities that families can share at home are terrific fun. But there’s no “indoor sport” quite like air hockey to let children develop hand-eye coordination while providing a full release for their competitive juices and pent-up energy at the same time. A brief check of any arcade, bowling alley or other entertainment center where there’s an air hockey table will show you how much of a favorite the game is among kids. Most would never think of asking their parents for their very own air hockey table at home, because the sport seems like one that’s only accessible if you’re pumping quarters or tokens into an enormous, professional table. Additionally, the space that a full-scale air hockey game requires is so large that the idea of playing air hockey in the house might seem impossible. But it’s not. Lucky families with plenty of room in a garage or basement might be surprised at the quality of air hockey table they can afford, and there are lots of smaller-sized options which replicate all of the game’s fun without having an enormous footprint. Even a good table-top model can provide an afternoon or evening’s worth of family fun for a very small investment, as long as the kids can tone down their enthusiasm enough to control a puck on a much smaller table. If you’re thinking about purchasing an air hockey table for your home, take our word for it: your kids will love you for it. And you’ll have just as much fun as they will, once you give it a try. Our list of the top 5 best air hockey tables for kids will first check out a couple of full-sized, seven-foot units, and then move on to smaller and less-expensive models. Yes, this model costs a little over $600, which seems like a lot of money until you know that “professional-style” home air hockey tables will run you more than $2000 (sometimes, a lot more). And the Atomic Blazer gives you almost everything those pro-style tables do, except for the heavy-duty casings required in commercial environments where people are playing the games non-stop and often abusing the equipment on a regular basis. This table (and other home models) may get dinged up fairly quickly because it’s made from medium-density fiberboard (MDF) instead of metal or solid wood. But it’s sturdy and durable, and the dings shouldn’t affect game play or fun. A seven-foot by four-foot play area is the standard for a full-sized table, so this 7x4 model with a ¾” PVC playfield will seem just like the ones at the arcade. There’s a heavy-duty blower motor on the Blazer which makes the action smooth and fast, and we like the fact that there are integral overhang railings which keep the puck in play (most of the time, anyway – there’s no way to stop pucks from flying off the table every so often, as every player knows). We also like the metal strips around the inner sides of the table which protect against impact damage. A level air hockey table is naturally required for fair play, which brings us to another great feature of this Atomic model. The 6” wide pedestal legs (providing great stability for the table) each have built-in 5” wide leg levelers, which allow you to ensure that the play area stays level wherever you install it. For bells and whistles, there’s a fold-up electronic scoreboard (which does run through AA batteries very quickly) and somewhat-annoying sound effects (which can be turned off if desired). 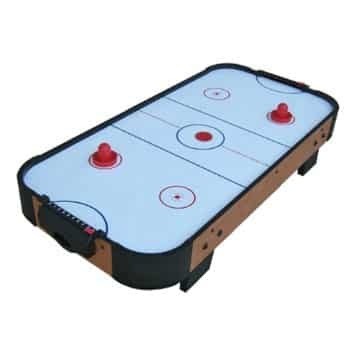 You can also get an optional ping-top table top to fit right above the table hockey surface. Kids and adults will both enjoy the Atomic Blazer because of its full size and fast speed; just remember that it’s going to be heavy to move and that you’ll need some extra clearance around the table to allow you to reach those pucks easily. We actually liked the Viper Vancouver a little more than the Atomic Blazer. We rank it a bit lower, though, because it costs an extra $200 for the extra features it provides and we’re not sure that most readers would consider the extra cost worth those features. But if you’ve got a little extra to spend, read on. This is another full-sized table made from MDF with a PVC play area, with pedestal legs and integral leg levelers. It’s sturdy – in fact, it’s heavier than the Blazer, one reason we liked it a bit more. There’s plenty of air flow to keep the game action fast, and there are deep inner rails to keep the puck on the surface rather than the floor as much as possible. There are also dual puck returns on either end of the table. The Vancouver is an attractive air hockey table, looking somewhat more professional than the Blazer. One small but nice aspect of the overall appearance is the large, dual-faced electronic scoreboard which is situated on one side of the play area rather than above the surface, and lets you track and count down time as well as just the number of goals scored. A drawback is that the sound effects can’t be turned off, but they’re not as obnoxious as the canned sound you usually find on games like this. This Viper table is the nicest mid-range model we’ve seen, and while it’s not going to last as long as one of those “armor-plated” machines you see in arcades, it should hold up to the battering it will get from energetic pre-teens and teenagers without a problem. Just be advised that it can be an hours-long project to assemble; once that’s been accomplished, though, the fun will be worth it. We now move on to smaller air hockey tables which will fit a smaller family game room, a smaller budget, or both. The one-foot difference in length between the Derby and the two full-sized tables we’ve already discussed isn’t going to make an enormous qualitative difference in your game play, but it could make the difference between having enough room for a table and having to go to the arcade. The cost under $400 may make a big difference to you as well. The construction of this Playcraft unit is similar to the first two entries on our list of the top 5 best air hockey tables for kids. It’s made from MDF (with a cherry wood grain finish and chrome accents, a black PVC finish is an extra $50) and has a glossy, scratch-resistant PVC play area and pedestal legs with built-in levelers. The power in the blowers isn’t quite up to that of the larger tables we’ve looked at, but it’s more than sufficient for fun game play. There’s a single-face electronic scoreboard with multiple setting options – and perhaps the best feature of all is that the Derby comes mostly assembled, so there’s less wrestling with this air hockey table than with most other larger models before you can start playing and enjoying yourself. Will it last forever? Of course not. But it will certainly give your family more than $400 worth of enjoyment. With another step down in size, we take a huge step down in price as well. The playfield on the Harvil air hockey table is a little less than half the size of a full-sized table, but it will only cost you about $100 – so it’s perfect for the smaller kids in your family who aren’t ready for full-out game action, and may not even be able to reach across a 7-foot table in the first place. The Harvil is constructed from lesser-quality MDF, and has L-shaped instead of pedestal legs (with levelers) so you shouldn’t expect this to be a durable piece of indoor sports equipment. However, it will hold up decently under the less-rigorous play of elementary school kids (or the gentle play of pre-teens and teenagers, if they have that sort of restraint in them). Play speed is medium because of the lesser-powered AC motor on this table, but it’s definitely sufficient and fun for the kids. There’s a small electronic scoreboard, but no puck return; you have to reach in and retrieve the puck from the goal after every score – a slight annoyance, of course, but worth putting up with for $100. If you’ve been motivated to buy your very own air hockey table after having a blast playing against friends at the local pub, this is not your best option. In fact, it’s not an option at all, because you’ll be severely disappointed. For the young kids in the family, though, it should be more than enough to get them away from the PlayStation for a few hours. Versatility and convenience are front and center with this budget table-top model from Playcraft, which has a play area that’s small enough to fit almost anywhere, can be picked up and stuffed in a closet when not in use, and will only cost you about $70. The 40-inch surface is ideal for young players and the air flow provided by the motor is nearly as strong as on the Harvil we just reviewed, so there will be more than enough action to keep the kids enthralled. The frame is built from decent-quality MDF so it’s not going to fall apart on you; there are legs on the frame but primary support is provided by the table it’s placed on, meaning it will be sturdy enough for the kids and even for grownups who use a light touch while playing. You should expect the Sport to last at least for a year or two. It won’t slip and slide on the tabletop either, which was one of our main concerns going into this review. One difference between this Playcraft and the other air hockey tables on our list: it uses two-inch pucks instead of the standard three-inch pucks you’re probably familiar with, and that means the strikers are also smaller than you’d expect. Once the game starts, you get used to the difference quickly, however.